Saturday was another early start with many miles to cover, with a visit to the settlement in the bush at Gobor led by Archdeacon Eli Mawa. We were greeted by children running alongside us and singing so beautifully. 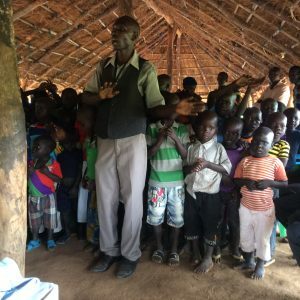 Here they have so many very young they have set up a bush school for 3-6 year olds with a single gift of £100 back in January. 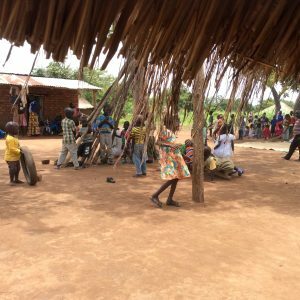 They have an inspiring teacher, Emmanuel, who has taught them with next to no materials – songs – poetry – rhymes – games and so much more in a big space under a big tree. Alongside, they have built a beautiful church with branches and a low grass roof (so wonderfully cool to sit under in comparison with any other roofing material), which they can divide up with removable cloth walls. It was beautiful to witness the simplicity of this community, with an extraordinary leader, who though unwell continues as he has been called, to be an inspiring leader. Caroline was taken to inspect their ‘amazing’ agricultural project half an hours walk into the bush, though they have very little food security because they are not allowed to grow crops on any of the (Ugandan) surrounding land apart from the very small plot in front of their tookul. These people have so little and yet SO much and the joy of their welcome and the celebration was such a privilege to share in. Andrew and Fi again did some teaching together and Andrew had the opportunity to minister to a few and Fi met a young single mother of 24 with very good English and a baby boy who had left Kampala to come and be with her grandmother there…she was worried about managing her epilepsy and struggling to settle in and make friends. She wanted to train as a teacher or nurse, which in the circumstances we agreed was not going to be a reality…but when it was suggested that she spoke with the headteacher and offered to help him with the children and learn from him ‘on the job’, her eyes brightened – she had a plan and her boy would be able to join in the school when old enough. It was but a brief stop before we had to move on to Moyo to meet with Bishop Emmanuel and his team, having a shared meal with the Kajo Keji parents and being able to renew relationships with all those in the CRESS family there. 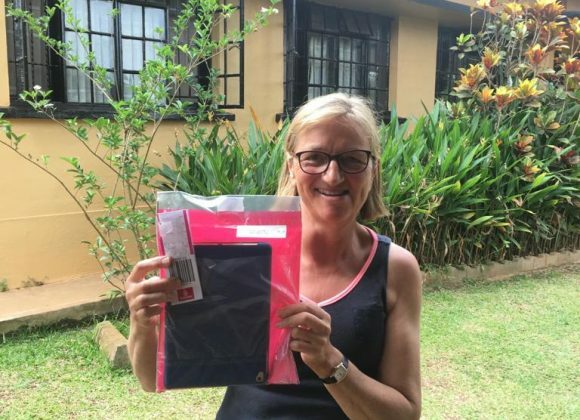 Beatrice Kiden (Jane Poggo’s sister) was able to come and stay with us at the Catholic Mission for a night and share with us the progress she has made since she met with Fiona in January. It would be true to say she feels transformed, having learnt much about her emotional health at the time and put into into practice the techniques and strategies. She is now leading the women and children, many of whom are traumatized, in her church in Bellamaling Camp where she lives with her family. She is able to counsel them, teach and support and has been put forward for the CATT training programme to grow the skills she needs to bring more freedom to those there with her. A very full day enabling us to glimpse such an extraordinary juxtaposition of joy and suffering, which leaves us knowing we will still be assimilating the wealth of experiences long after we return home.